I’ve always been fascinated by the concept of Battle Dragons! Imagine a Western Dragon, that’s already powerful beyond belief; and yet, becomes transformed when adorned in Dragon Armour. 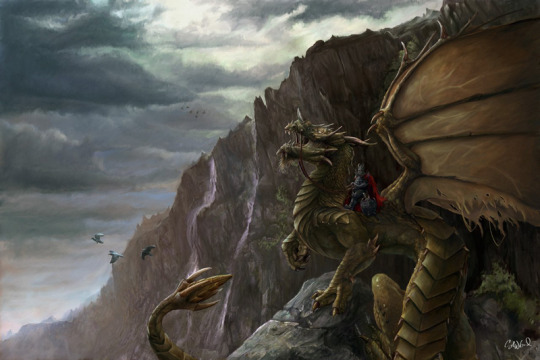 No longer would such a Dragon – have to fear, a Dragon’s Claws, nor Longbow’s Arrow. Swathed in Armour, deflecting blows. Swathed in Plate, hard as Ice. Swathed in Blacksmith, hot as Fire! A Skilful Steed, upon this Knight. A Dragon’s Army, upon this – Precipice! I speak of Battle Dragon. A Formidable Force, with Glowing Eyes. A Dragon’s Roar, with Shiver to my Spine. A Dragon’s Grip, with Strength in his Arms. A Dragon’s Tail, with Bite in his Barb. A Dragon’s Wings, with Sky to his Eyes. A Dragon’s Pose, with Flight to his Mind! I speak of Knight. This Dragon’s Keeper, Might of Steel. This Dragon’s Keeper, Cape of Red. This Dragon’s Keeper, Shield of Fire. In Darkest Night, these Clouds of Rain. In Blackest Sky, these Crows of War. In Grey-est Heavens, two Paths in Light – a Silver Tongue, Precipice and more! I speak of Element. This Dragon’s Fire, quashed for now. This Dragon’s Air, quite for now. This Dragon’s Water, quenched for now. This Dragon’s Earth, braced for now. BUT! Brace for Hurricane! This Dragon’s Fire, burning bright. This Dragon’s Air, rushing by. This Dragon’s Water, ripped a path. This Dragon’s Earth, braced for rent. This Dragon’s Spirit “War-Cry” of Battle Dragon. Up and up, did this Dragon – soar! This entry was posted in Fantasy Dragon Art and tagged battle dragon, blacksmith, dragon, dragon armour, fantasy, forge, knight, mythical creatures, western dragon. Bookmark the permalink.